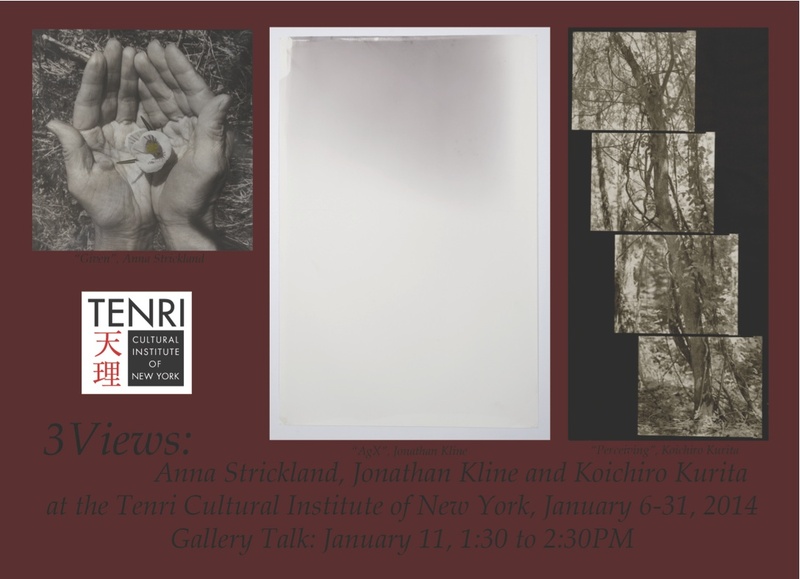 Anna Strickland, Jonathan Kline and Koichiro Kurita" January 6-31, 2014. Although there will be no official opening party there will be a Gallery Talk on Saturday, January 11th from 1:30 to 2:30PM. The exhibition brings together three photographers with many overlapping and shared views related to natural phenomena and historic photographic processes. One other unifying feature is the nature of handmade pritns whereby each photographer mixes their own chemistry to create unique images on fine art paper. The master photographer, Koichiro Kurita, known for his virtuoso large-scale platinum/palladium prints will exhibit work from his series "Perceiving". "Perceiving" is a work that illustrates Kurita's philosophy toward the natural world and his dedication to 'slow photography'. Anna Strickland and Jonathan Kline have both spent decades teaching historic processes, Strickland at Rhode Island School of Design and Kline at Bennington College respectively. KKline who will exhibit work from his "AgX" project which is camera-less photography in its most quintessential form the subtle recording of light over time. The virutuoso large-scale salt prints are as subtle as the light recorded. Strickland will exhibit palladium and gum-bichromate prints from her installation "Given" which has to do with acknowledging all that is 'given' to us each and everyday by being present in the natural world.